...in moments of gladness when our children and grandchildren walk down the aisle to wed.
...in moments of sadness and reflection when we surrender our loved ones to death. ...in moments of joy when families traditionally gather - Thanksgiving, Christmas, Easter - and express their gratitude at special liturgies. And between these important milestone in life, the instrument's music would be there to enhance our liturgical celebrations, to educate our children to finer things, to stimulate our sense of community, to touch our spirits and bring us closer to our God. In the spring of 1995, at the request of the pastor, the Rev. Martin McGuill, a group of Saint Luke parishioners formed the Pipe Organ Committee to achieve the goal of the 1977 planners. Members of the committee were keenly aware of the declaration of the Constitution on the Sacred Liturgy of the Second Vatican Council that "The musical tradition of the universal church is a treasure of inestimable value, greater even than that of any other art." The goal was to unlock the gates to this treasure with a fine pipe organ. A "special privilege" is attached to the pipe organ, the council group wrote, "for it is the traditional musical instrument which adds a wonderful splendor to the church's ceremonies, and powerfully lifts up one's mind to God and to higher things." When the generous response of parishioners to committee appeals indicated that the project would succeed, the late John R. Keating, Bishop of the Diocese of Arlington, gave permission to sign a contract for a new instrument. After examining the work of and interviewing the principals of five prominent pipe organ designers and builder, our parish selected the firm of Steiner-Reck, Inc., of Louisville, Kentucky. Every fine pipe organ is unique in that it is designed to the size, configuration and acoustics of the room where it will be located. Our designer Gottfried Rock, spent many hours in our church, listening and measuring and getting a sense of the character of the building before setting to work. It is the designer's practice to submit not only the usual drawings of a proposed instrument, but also photographs of a model he constructs both of the instrument and of the area of the church where it will be located to convey an accurate sense of the final appearance. The model photos and other descriptions of the instrument were brought to the attention of a substantial number of persons involved in parish activities. Based on their enthusiastic response to the pipe organ's striking appearance, and the approval of technical aspects by Dr. Paul Skevington, the parish director of music and liturgy, the pastor and the Diocese of Arlington approved the Reck design in March, 1997 with minor modifications. Steiner-Reck ordered the organ's 3,097 pipes from their manufacturer in Germany. The instrument's steel frame, the beautiful exterior woodwork and the operating mechanisms were produced at the firm's Louisville facility where the organ was first assembled. Three trucks bearing all the parts of Steiner-Reck Pipe Organ Opus 104 arrived at the church on February 9, 1998, and assembly began immediately. Parishioners with cameras dropped into the church daily to record the process. A reporter and photographer from The Washington Post spent hours watching the assemblers - a remarkably young team of two men and a woman - clamber among the steel beams of the superstructure behind the beautiful stained white oak cabinet, fitting pipes, tracker links and other equipment into place. The eventual Post story declared the instrument "architecturally stunning" and a "striking visual presence." The assemblers finished on the eve of the Paschal Triduum. On Easter Wednesday, the "voicer" arrived from Germany to tune the instrument - one pipe at a time. The number of visitors increased because, for the first time, they could hear the organ as the tuners played simple classical pieces to test their handiwork. The complexity and beauty of the sound grew as new sections of the organ were brought into tune. Tuning ended on May 16. The afternoon of the following day, the Sixth Sunday of Easter, 1998, the parishioners of Saint Luke filled the church for the Solemn Blessing of the Saint Luke Organ and to hear the new instrument in all its magnificence for the first time in the dedicatory recital. The blessing was bestowed by The Most Reverend Thomas J. Welsh, D.D., J.C.D. the founding bishop of the Diocese of Arlington and the retired bishop of the Diocese of Allentown who had dedicated Saint Luke Church. The 21-year-goal of Saint Luke's planners had been realized. 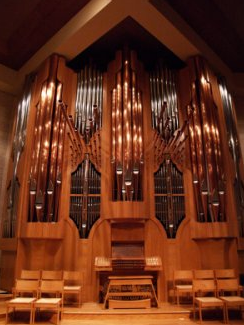 The 61 rank Steiner-Reck organ is the largest pipe instrument in the Northern Virginia area. The pipes are controlled by action that is both mechanical (from the main console) and by electric action from the moveable console, which allows for needed flexibility when working with ensembles, choral groups and orchestras. 32'	Subbass	16	el. gen.